Hello 36th Avenue readers, it’s me Angelina from JoJo and Eloise. I can’t believe another month has already gone by and we have Summer in Full Swing! I don’t know about you, but lately I’ve been needing projects that are, Quick and Easy. With kids being out of school, that means lots of play dates, extra daily activities and family vacations. Simply means very LITTLE time. 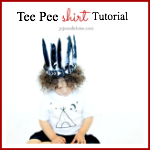 So today I thought I would share how I took an ordinary t-shirt, with a simple Tee Pee drawing and made one ADORABLE little shirt. I am not even going to lie. This project literally took me all of 15 minutes to put together. (for more instructions on that you can go here to see the products I used). NOTE: You could skip all this and just a good old fashioned Fabric Marker. And, lastly a Design of choice. I drew out a basic Tee Pee with the Moon and Stars. Place your Paper Drawing inside your t-shirt. As well as a piece of cardboard to protect from, paint bleeding through. Using a pencil trace your design. If using a light colored fabric you will be able to see faint lines you can trace. Then using your FINE paint brush, begin drawing on the pencil lines. When you are done, allow it dry and follow the instructions on your manufactures bottles. For Fabric Paint or If using Fabric Medium. I ended up adding a few extra stars then what my original drawing had. I am SO in LOVE with how this came out. The possibilities are just ENDLESS!! So what are you waiting for, start digging for that plain Old t-shirt. Look in your laundry (dirty or clean ) or in your kids dressers. And, get to painting! Because there is some Serious Cuteness that needs to happen in your life today! I will be sharing on my blog later this month, how I made this Cute little Indian Headdress. And, you know you don’t want to miss it! Because!! It is just, WAY to0 Stinking Cute!! Thank you again Desiree for having me over. I am making this t-shirt for sure… It is so adorable! Thank you so much Angelina for sharing the tutorial. Here are some other projects that you can find over at JoJo and Eloise. How to up-cycle shoe tutorial here. 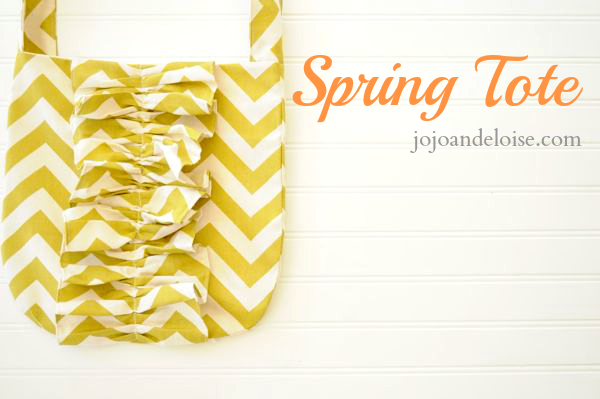 Also check out this adorable Ruffle Tote Tutorial here. 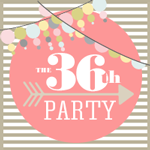 Before you go make sure to click here to link up your projects to our party! Thank you for stopping by… Let’s have a wonderful day! That is so simple, sweet, and cute, I love it! Pinning! !